Mortise-and-tenon, dowel and dovetail joints have been tested through the centuries and have proved their worth. 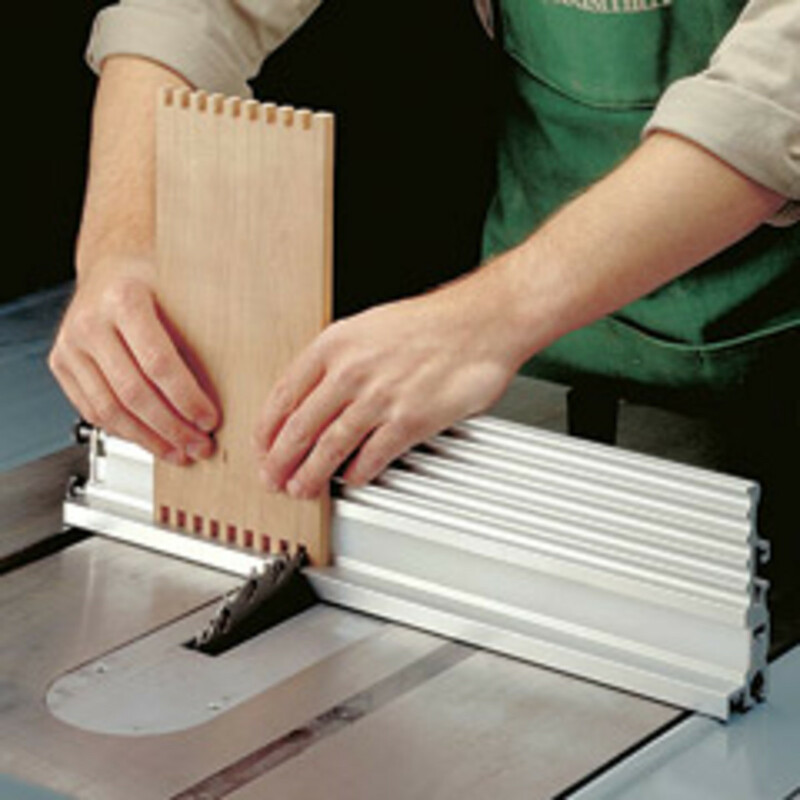 In the mid-1950s, joinery departed from the traditional when Swiss woodworker Hermann Steiner invented Lamello biscuit joinery, and in 1986 it took another big step when Craig Sommerfeld came up with the Kreg pocket-hole jig. Since then we’ve seen a series of attempts at improving the way that we stick two pieces of wood together. Some have captured our imaginations, a few have captured our billfolds and many have fizzled away to obscurity. But in the last few years, some rather impressive innovations have come along that offer a new alternative that is either quicker, stronger or both. Invented by woodworkers and often refined by engineers, these new joinery options could fundamentally change the way that we work. 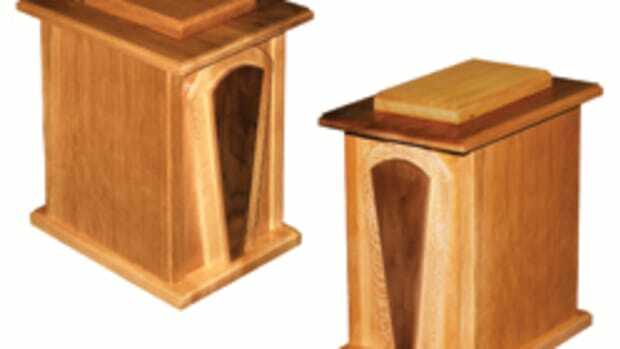 Adding a new twist to an old theme, the Canadian manufacturer of Dowelmax (www.dowelmax.com) claims that its jig will deliver a joint that is three times stronger than biscuits and takes 90 percent less time to construct than a traditional mortise-and-tenon joint. For shops that don’t own a dedicated horizontal boring machine, the jig is relatively inexpensive and simple to use. It allows the woodworker to drill from one to five dowel holes that are equally spaced and close together for a very strong joint. My reason for mentioning the Dowelmax up front is that the manufacturer has an interesting chart on its website. The company ran a strength test on various joinery methods and published results that indicate a No. 20 biscuit would support 285 lbs. per square inch of pressure (the test shows sideways pressure on a 90-degree joint). A pocket-hole joint with five screws came in at 420 psi, the double Domino was at 560 psi, a routed mortise and tenon posted an impressive 640 psi and its product, the multiple dowel, took home the prize at 890 psi. While other manufacturers will challenge the test results on the basis of materials, glue, stock sizes and so on, the bottom line is that many alternative joinery methods are extremely functional and strong. And while strength isn’t always the primary issue (think face frames, for example), it is nevertheless an important criteria in most joinery. Hot on its heels is speed, especially in a production environment, so most of the new joinery options on the market are designed around both construction time and ease of use. 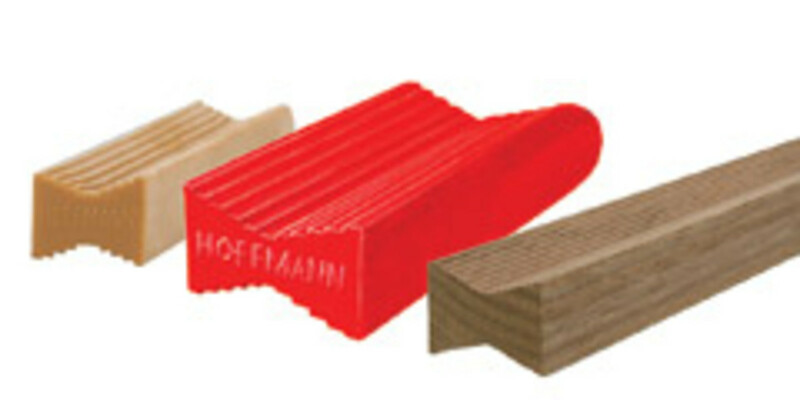 The Hoffmann dovetail joining system is a great example of this (www.hoffmann-usa.com). Based on classic dovetail joinery, Hoffmann uses molded keys to create perfectly aligned and tight joints. The company offers handheld, benchtop and even floor model machines that cut dovetail-shaped grooves. Corresponding keys come in plastic, hardwood, metal and rubber varieties in four different thicknesses and in lengths ranging from 1/4” to 4” long. The keys are a double dovetail (an end view looks like the shape of a bow tie). The concept is simple: a tapered cut is made in each piece of wood and the key is then tapped into place. Because of the taper, the joint is pulled tight as the key is driven home with a hammer. A demo video on the company’s website shows an angled joint being made where the plywood side of a cabinet meets the face frame at 45 degrees, and it takes barely a minute to line up and make the long glue joint. The joinery can be completely hidden, so it’s ideal for assembling face frames and cabinet carcasses. Or the key can be exposed when using the hardwood option, adding an attractive accent. One thing worth noting is that most examples show the plastic dovetail keys drawing a joint together that ultimately relies on glue for strength. The keys act as a clamp while the glue sets — and the strength is in the glue. 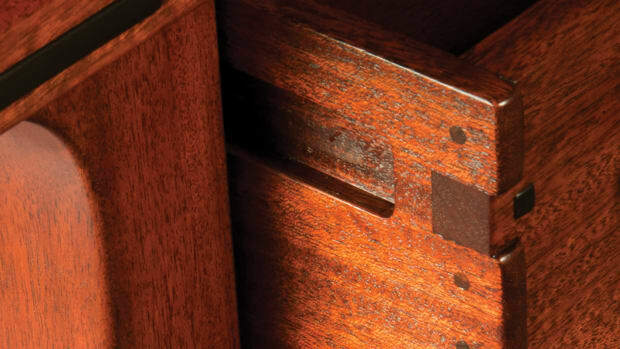 While Hoffmann offers a quick and relatively easy way to join parts based on an historic concept (dovetails), another foreign company has taken the traditional mortise and tenon to new heights. 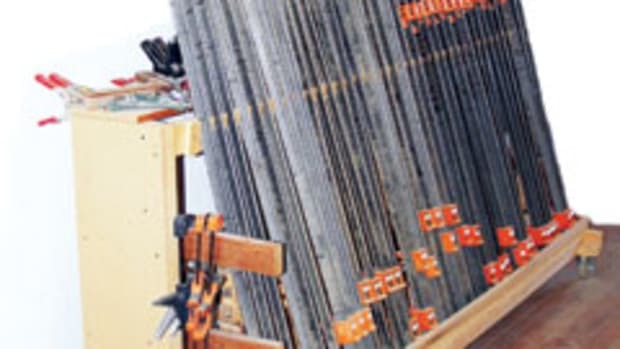 Most woodworkers are familiar with dovetail jigs from Leigh Industries Ltd. in Canada (www.leighjigs.com). The company also offers two mortise-and-tenon jigs, the professional FMT Pro model and the Super FMT. The latter was designed for home workshops. Both devices will mill joints with single, double, triple or even quadruple floating tenons and they are ideal for furniture applications such as doors, tables, chairs, benches, built-in dining booths and other furniture that sees heavy use. The FMT Pro includes optional on-board dust collection and is of considerably heavier construction. While at first glance they look quite complicated, the FMT jigs are actually simple to operate. They mill both halves of the joint (the mortise and the tenon) and do so using just one guide, one router bit and one jig setup. A plunge router is required. Shops that build furniture more than casework will find this system for creating true mortise-and-tenon joinery is fairly quick, easily learned and very accurate. 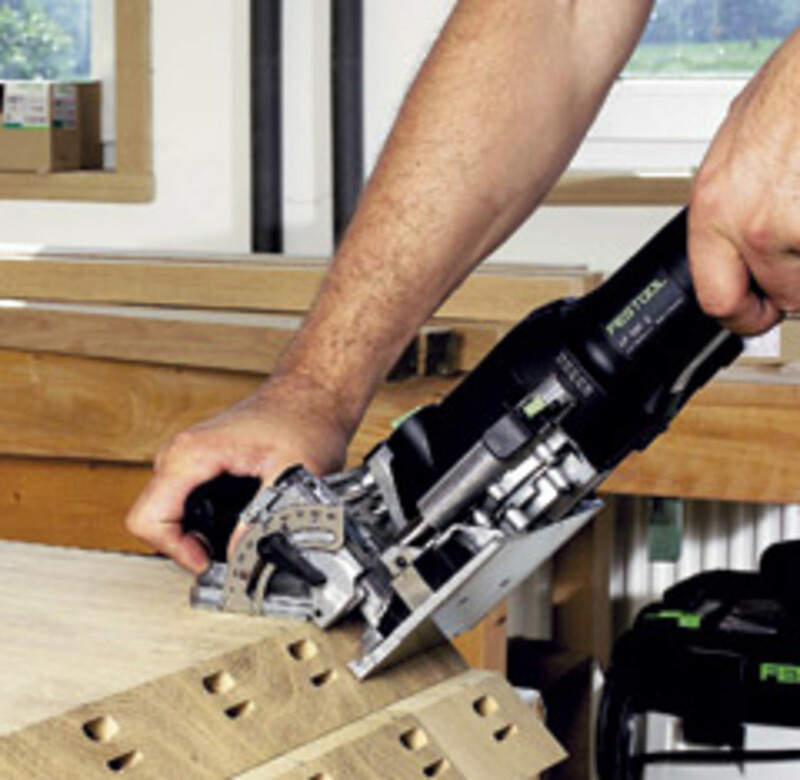 Those attributes can also be attributed to the exquisite Domino from Festool (www.festooldomino.com). This machine cuts two mortises and a separate, floating tenon is then used to complete the joint. These relatively lightweight, portable tools replace stationary machines like hollow chisel mortisers and slot mortisers. Two models are available: the original DF 500 (weighing in at 7 lbs.) and the new XL (11.4 lbs. ), which is designed for larger projects. The DF 500 mills mortises from 5/8” to 1-9/16” deep and the XL extends that range by handling depths from 19/32” to 2-3/4”. Domino tenons are available in 4, 5, 6, 8 and 10mm thicknesses for the DF 500 and 8, 10, 12 and 14mm thicknesses for the Domino XL. The 4mm tenons are perfect for materials as thin as 1/2”, while the largest tenons (about 5-1/2” long) are great for large-scale joinery like doors, gates, timber frame joints and creating large natural-edged or thick slabs for counters and table tops. 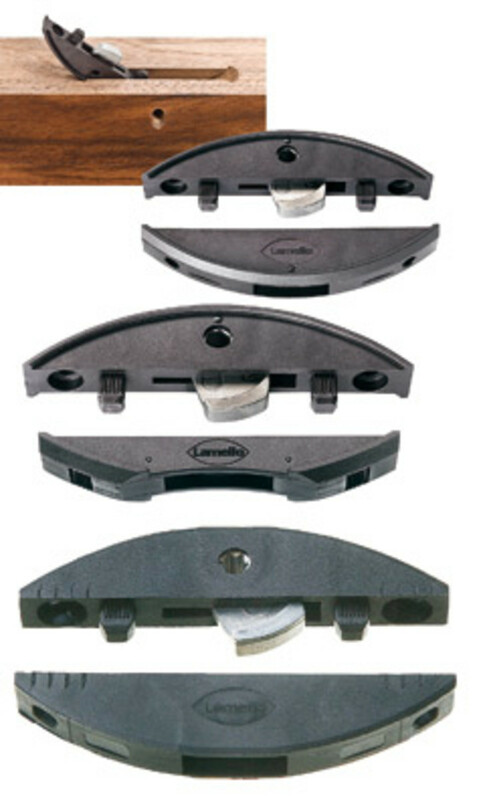 A smaller concept for regular joinery is the Lamello Clamex P-15 (www.csaw.com). This is a biscuit-shaped knockdown connector that comes from the original inventors of biscuit joinery. Its huge advantage is that it can be disassembled. The Clamex P-15 joins any mitered angle without glue or screws to create nearly invisible ready-to-assemble connections. To complete the joint, a woodworker slides the connectors into pre-cut slots and then locks a cam lever in place by turning a hex key that just pulls the parts together (yup, you have to drill a hole for the hex key). This allows the shop to build a cabinet or piece of furniture, break it down to ship (or to get through a narrow doorway) and then reassemble it at the site in a few minutes. The P-15 connector and a new smaller version called the P-10 share a design element that sets them apart. Along the outside arc of each, there is a raised edge that slips into a T-shaped slot. This creates a mechanical joint (no glue or screws required, although woodworkers can add screws if they want). Another Clamex connector, the Medius, shares this feature and adds another: part of the back edge of the Medius is missing, so it isn’t quite as deep. This allows a woodshop to, for example, fasten a shelf halfway up a center dividing panel because the slot is less than 3/4” deep. And the last member of the family, the Clamex S, doesn’t have the raised edge: it requires screws, but it can be installed with any Lamello biscuit joiner as it doesn’t call for a special blade. 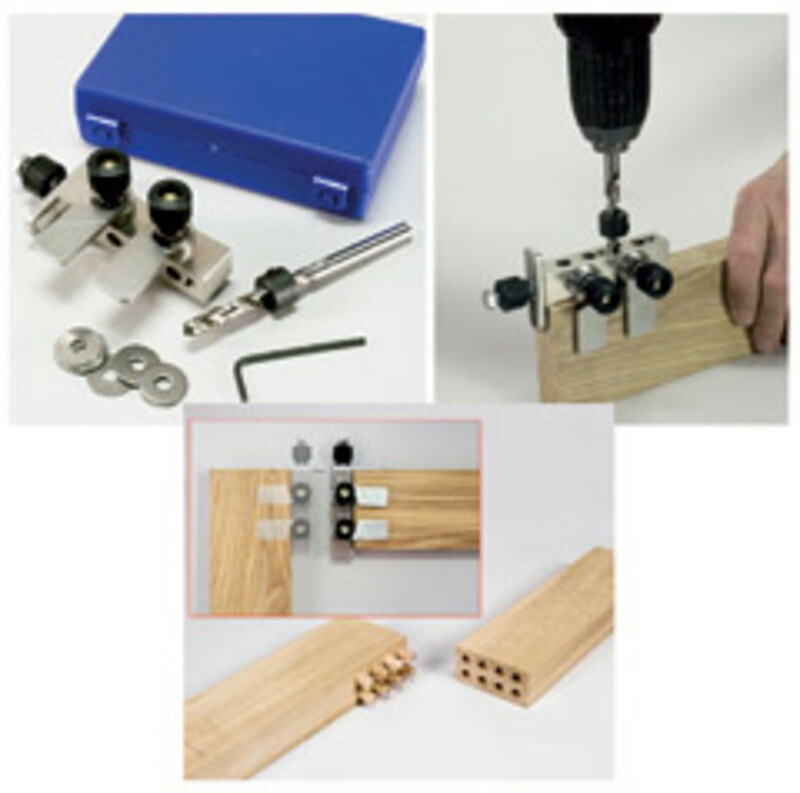 Somewhere between dowels and Dominos is the Beadlock system from Rockler Cos. (www.beadlock.com). This uses a simple drill and guide jig to bore several overlapping holes before the company’s loose tenon molding fits into the cavities. One advantage of this jig is that the length of the mortises is only limited by the length of the drill bit used, so deep tenons are an option. The Joint-Genie (www.joint-genie.com) follows much of the same logic. This is a simple steel bar with guide holes drilled in it, but it has a fan of steel leaves on the side that allow the user to center the jig on the edge of a board up to about 1-7/8” thick and it will also work on stock of unlimited thickness (not necessarily centered). The Joint-Genie also has a positive stop on the end of the jig that allows one to line up and clamp it in place for drilling mirror images of a set of holes. Inexpensive and small, this is an ideal job-site jig. It can be screwed to the work, too, so it can be located pretty much anywhere on the workpiece (the screw holes disappear.) One can also use a dowel as an indexing pin, so the short jig can drill an essentially unending row of equally spaced holes in a straight line. 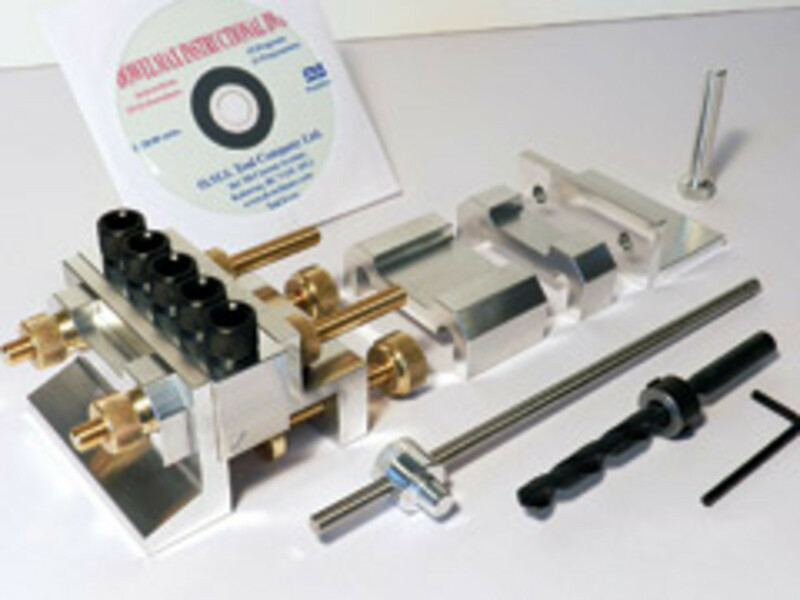 There are numerous machines that will mill more than one type of traditional joint, such as the JDS Multi Router that handles mortise and tenon, box (finger) and dovetail joinery (http://jdstools.com), and a plethora of other small jigs that deliver dowel joints. 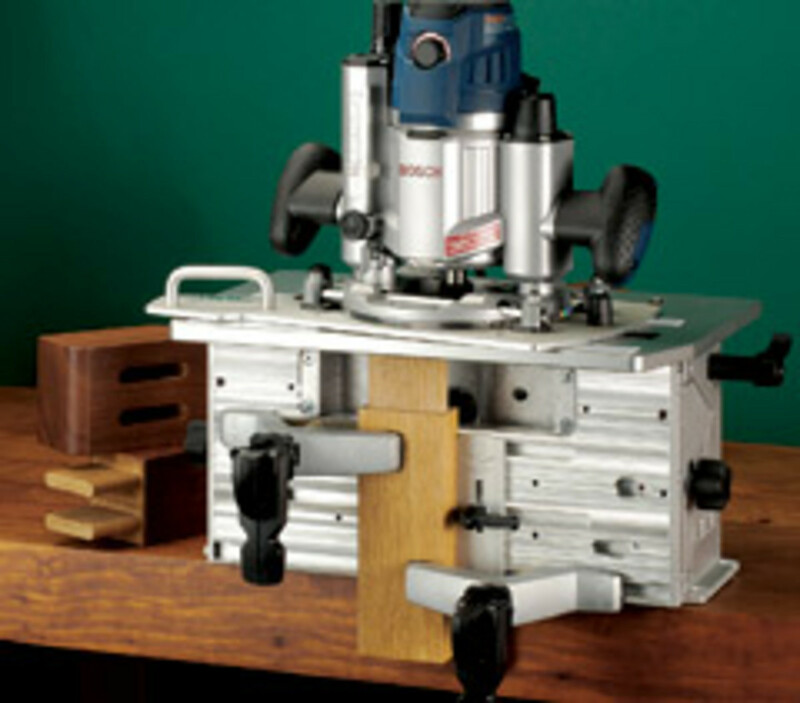 There are numerous companies making versions of the Kreg pocket-hole jig and Woodsmith makes an exceptional box joint jig (www.woodsmithstore.com). But no matter what new inventions come along to make life in the shop a little easier, none will ever be quite as much fun as laying out and hand-cutting a perfect mortise and tenon.